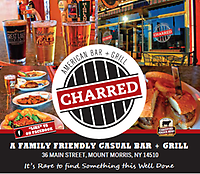 Charred American Bar + Grill is a neighborhood restaurant & bar focusing on great food & beverage, atmosphere and outstanding service. The menu is a traditional American fare featuring standby classics, as well as more innovative dishes. We offer a broad beer and wine selection. In good weather, additional outdoor seating is available.